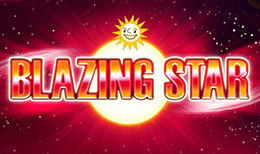 Blazing Star is a simplistic 5 reel that features all your traditional fruit machine symbols including watermelons, oranges, lemons, grapes and a whole range of exciting paylines for you to sink your teeth into. Blazing Star is a perfect entry point for any new gamblers looking to learn the concepts, reels and payline structure involved with online slot gaming. In addition, there’s the opportunity to generate a whole load of free spins and win yourself a significant portion of cash. Check out the list of casino games. Merkur Gaming was founded in 2006 and is part of the massive Gauselmann Group, which was founded in 1957. The company focuses on international business and serves several casinos worldwide. The development team is filled with innovation and passion and stay traditional to the slot games. They are always up to date with the latest industry standards and offer high quality casino games. Merkur Gaming provides country-specific content as they strive to entertain in the best way possible, no matter what language you speak as at Merkur Gaming “They speak gaming”. This game is all about the traditional gameplay experience of classic slot machines. All the symbols are very traditional except for one. Behind the reels you can look at a fiery surface of a vast sun that looks extremely hot and dangerous. The background of the reels is a simple plain black surface. All the game controls are found beneath the reels and are easy to understand so that you can emerge quickly into the game. On the five reels and three rows you will find a nice plum, big lemons, juicy oranges, a watermelon cut in half, some cute cherries and purple grapes. The only non traditional symbol is the bright sun. It is the highest paying symbol and when you get a payline consisting of five sun symbols you will win a massive 100x your line stake. There are no wild or scatters that activate any bonus features as this game only focuses on the traditional slots experience on a very high quality standard. The only extra feature is optional and consists in gambling your wins. After you land a winning combination you may activate this feature and choose from two different and thrilling mini games to increase your winnings and make your spin even more lucrative. Both mini games have a maximum payout of a 140 pounds. You can either choose the card gamble, where you have to guess correctly the colour of the next card drawn, or the exciting ladder gamble, where you will have to work yourself up a fruit machine-style ladder to get bigger wins. There are only five fixed paylines in this game and to try a spin yourself in this entertaining game, you will have to bet a minimum of 5p or up to 10 pounds. Blazing Star will provide a very classic gameplay experience as it features traditional slot gameplay with no bonus features, wilds or scatters and lots of traditional symbols on the reels such as the lemons or cherries. The art-style looks very polished and add a lot to the game feel.The game controls are very intuitive and will help to get you into the game flow. This game is not particularly a game for high rollers but it will still entertain you with its traditional simplicity. Blazing Star is very simple and easy to understand so it is perfect to dive in for a quick game. If you enjoyed Blazing Star you might also like Double Triple Chance.